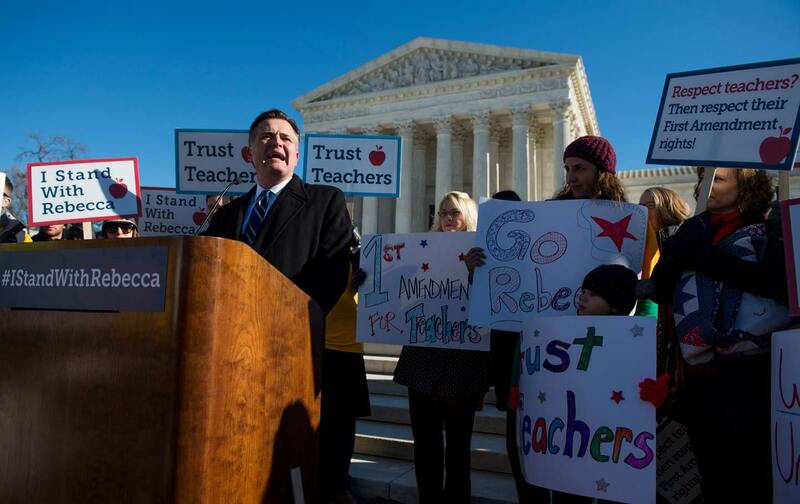 Should the Supreme Court rule for the plaintiff in Friedrichs v. California Teachers Association—as, given what transpired in oral arguments, seems eminently likely—the right-wing backlash against organized labor of the last several years, from the stripping of collective-bargaining rights to the passage of “right to work” legislation in former union strongholds across the Midwest, will appear to be mere tremors before the “big one.” It is an earthquake that will be felt everywhere in American politics, and in American life. If the Court decides that requiring public-sector workers to pay either union dues or “agency fees” toward the bargaining done in their name and from which they benefit violates free speech protections, thereby embedding even deeper in constitutional law the farcical notion that money is speech, unions expect to see a dramatic decline in membership, revenue, and, consequentially, political activity. The great bulwark of progressive politics in the United States will be undermined at its very foundations. After last month’s oral arguments in Friedrichs v. California Teachers Association, there’s not much doubt that before the end of its term in June the Supreme Court will rule that the “agency fees” that non-members of public employee unions are required to pay to cover their share of collective-bargaining costs violate those individuals’ free-speech rights. For the right-wingers who rushed this case to the Court to get a decision before November’s elections, such a ruling, overturning a 40-year precedent, would be a three-fer: It would hit not only the lead defendant in the case and many other public-employee unions but also the Democratic Party, which receives much of those unions’ political support, and the public school system itself, whose funding and protection from privatization depend in considerable part on the unions’ political influence. But this case is not just about aggressive conservative activism or a right-wing Court that has made itself another political branch of government. In several ways, the unions helped create the atmosphere in which the Friedrichs suit was brought. It’s a long list: the rigid teacher tenure and seniority laws enacted through union clout in California and elsewhere that make it virtually impossible to fire even the most incompetent or abusive teachers; the resulting “rubber rooms,” or reassignment centers, in New York, Los Angeles, and elsewhere, where teachers accused of sexual harassment, drug abuse, and other offenses sat idly for months or even years, waiting for their hearings, collecting pay and benefits while doing nothing; the legal requirement that whenever tight budgets make layoffs necessary, the cuts are made following the LIFO rule (last in, first out), regardless of competence or commitment. The actual rubber rooms are mostly gone, but the so-called “dance of the lemons,” the constant transfer of incompetents, often to schools serving the neediest kids, and the warehousing of alleged abusers, continues. Beyond the schoolhouse, there are the lavish sick-leave guarantees, retirement deals, and other benefits that many police, firefighter, and correction officers’ unions have secured for their members and that state and local governments will be struggling for many years to fund. Consider, too, the political power of the prison guards’ unions in lobbying for costly “tough on crime” sentencing laws enacted in the past three decades; even with the reforms of the past couple of years, we’ll be paying for those laws for years. Yet in the backlash against the power of public-sector unions, as former New York Times Supreme Court reporter Linda Greenhouse recently pointed out, “police unions and correctional officers’ unions, which have stood in the way of reform-minded policy initiatives in states and cities across the country, have been exempt as targets.” The targets of the right, as in Scott Walker’s Wisconsin, have been almost exclusively teachers’ unions. For many reasons, public-safety unions enjoy nearly 100 percent membership among the people they represent; a ban on agency fees would be only a minor inconvenience for them. For the California Teachers Association, which depends on the agency fees of nearly a 10th of the teachers it’s required by law to represent, and for many other unions where a court decision outlawing agency fees would likely prompt more defections—and for the public schools—it would be a major blow. Republicans, privatizers, and union bashers will be thrilled. Things might have gone otherwise for both the CTA and its parent organization, the National Education Association, whose 2.9 million members make it the largest labor union in the country. Thirty years ago, the late Albert Shanker, president of the smaller American Federation of Teachers, a smart labor leader and a committed school reformer, was the first to propose charter schools as an alternative to vouchers and privatization, schools that would have the freedom to innovate and provide alternatives for disadvantaged kids stuck in awful schools. Shanker wanted to professionalize teaching and put the unions in the forefront of progressive school reform. He won small victories within the AFT, but the NEA, stuck in the old industrial-union paradigm, resisted to the point where even the Obama administration cheered last year when a California judge struck down the state’s teachers’ tenure and seniority laws. As the legacy of Albert Shanker testifies, it did not have to be this way. After Friedrichs, unions will be tempted to react in all of the wrong ways: engaging in non-strategic mergers, circling the wagons around current members and contracts, isolating themselves further from the larger non-union workforce, and desperately attempting to preserve yesterday’s fading status quo in the few pockets of remaining union strength. These are the natural impulses of organizations and movements in crisis. But such fear-based, conservative, and restorationist impulses can only serve to hasten our already advanced decline. There is a better way. The most important remaining goal for legacy unions is to create new forms of worker power for a new century’s economy and workforce. Doing so will require risk and experimentation, and the creation of bold, public, morally compelling demands on capital and government, like the eight-hour day movement a century ago and today’s fight for $15 per hour. New organizational models and platforms must carry forward the DNA of our old enterprise bargaining system by developing the power to significantly raise wages, touch tens of millions of American workers across the economy, and create a sustainable revenue model that is independent of philanthropy. But it won’t look like old-school enterprise bargaining. And the organizations we give birth to won’t look like old-school unions. Instead, these new models and platforms could look more like politically constructed regional or sectoral bargaining (such as the Seattle minimum-wage commission, or the New York fast-food wage board); increased worker ownership of firms; a system of labor-employer co-determination as in European nations; more collective power over work distribution technologies like TaskRabbit and Uber; deeper and more effective labor standards enforcement; the launch of purchaser-facing certification and labeling; or better systems for connecting all workers with the quality, portable benefits they deserve—as well as other strategies not yet imagined. Eighty years ago, John L. Lewis and the other founders of the CIO had the prescience to recognize the strategic inflection point facing the American labor movement. They boldly transferred the resources, talents, and assets of legacy organizations (the United Mineworkers and several craft unions) to a then-newer model of worker power (industrial unionism). The result was decades of union growth and the birth of the modern middle class. Today’s labor leaders now face a similar moment. Will we retreat to familiar models that are clearly doomed, or will we invent the labor movement that we need for the next century? The answer isn’t only relevant for union members and labor leaders: no rich democracy has sustained a middle class, or even a democracy itself, without a strong labor movement. Already, half of American workers make less than $17 an hour and a third make less than $10. In the world’s largest economy, low wages and a disappearing middle class aren’t inevitable. It’s a choice. We should make a different one. To answer the question of how much responsibility labor bears for its current predicament, it is crucial to first focus it: How much responsibility do the officials who presently occupy decision-making positions in organized labor bear for its current predicament? Poor decisions cannot be blamed on those who have had little or no voice in them. The vast majority of union members bear no responsibility. What’s wrong with that? Two things: First, the recent call for innovation isn’t an answer in itself; second, it is a distraction from the right answer, which isn’t new but has been largely forgotten: Build real power through class struggle. Real power can only be rebuilt by strategies that empower the vast majority of workers. The answer to the neoliberal crisis is not further “innovation” but old-fashioned CIO–style actions like those of the Chicago Teachers Union, rebuilt in only a few years by nearly 30,000 teachers to the level of solidarity needed to sustain a massive strike, supported by a community of 120,000 parents and nearly 400,000 students. Not only has the union been rebuilt, but also Chicago’s working class, which is challenging corporate power—including structural racism—and not capitulating. Twenty years ago, in 1996, a new generation of union officials took the helm, on a campaign promise to organize the unorganized. But then, instead of organizing—placing the agency for change in ordinary people—they mobilized. Instead of empowering ordinary workers, they empowered staff; instead of bringing workers into the strategy war rooms to devise solutions to the crises they live with day in and day out, top “new labor” officials devised their own strategies that relied on professional staff, not workers: the carrot, tax and other subsidies for cooperative corporate employers; the stick, a “corporate” campaign waged against less cooperative employers. That is, after raising some of the right questions, they answered them essentially the same way as the generation they replaced. Having won leadership of the union movement, they decided they were smarter than the 15 million workers who made up its rank and file. Rather than committing every dime of union dues to rebuilding solidarity among the masses, to enabling workers to see themselves as the key actors in their own liberation, they devoted hundreds of millions of dollars to researchers, pollsters, and communications consultants—and they still believe these hired outsiders can research and message the labor movement out of its current mess. The decades-long strategy shift from deep organizing to shallow mobilizing, from putting ordinary workers into the struggle to putting communications specialists into “air wars” where the win is narrative change, has been a disaster—and it is coming back to haunt the labor movement in recent and pending Supreme Court decisions like Harris v. Quinn and Friedrichs v. the California Teachers Association. Early-warning flares blazed bright: massive membership losses in the Midwest, Wisconsin’s failed recall of Scott Walker, Michigan voters’ rejection of union provisions in their state constitution. What these mostly working-class people were rejecting was not a real labor movement that would better their lives, but strikes proclaimed by press releases, decisions made without worker input, two-tier contracts, and crippling concessions to bosses. The right strategy today is the same it always was: Power to the people—to the workers and their communities. Building that power is thoroughly possible, and it is done from the ground. There are no shortcuts. Can labor afford to take anything for granted these days? The public sector has preserved a representation model that guarantees financing but not necessarily allegiance. While this position has exposed civil servants’ unions to attacks from the right as inherently corrupt, their anomalous political role also gives them a public platform as protectors of democracy. Public-sector unions’ leverage derives from their position as a fulcrum in the machinery of government, standing apart from both officialdom and corporate influence. While the business lobby hopes Friedrichs will smother the public workforce, unions now get a chance to demonstrate to workers and the public their civic value, checking corporate abuse and balancing elected officials’ power. Post-Friedrichs, the influence unions lose with declining revenues may be offset by gaining political momentum through increased labor militancy. Ultimately, the rank and file will determine what forms of direct action they could take, but the ruling may change the calculus around organizing tactics. If veteran teachers in Chicago can mobilize an entire community to demand equitable school funding and richer programming, unions can elevate their public role both in serving members and further the public interest. That’s the most persuasive case for the rank and file to recognize, on their own terms, what their “fair share” is really worth. The possibilities opened by Friedrichs also reflect a demographic and cultural shift in labor’s political orientation in recent years. The right-to-work movement took aim at some of the most progressive and diverse elements of labor by targeting teachers in Friedrichs and homecare workers in Harris. Their unions represent sectors that are distinctly gendered, organically linked to their communities, and politically fraught. The citywide uprising triggered by the Chicago teachers’ strike, along with home-care unions’ advocacy for an equitable long-term healthcare infrastructure, attest to their intrinsic power to bridge family, civil society, and the state. That potential will remain largely untapped unless unions are able to organize fiercely and nimbly, with or without a closed shop. Labor might seize an opportunity to switch gears from merely acting as bargaining agents to fostering vibrant, participatory workplace democracy. When corporations distort civil-rights laws to weaken civil society, what sweeter revenge could labor seek than to match the “right to work” with the right to organize? David RolfDavid Rolf is an International Vice President of SEIU and the President of SEIU 775, and is known internationally as an innovative labor leader and thinker on the future of work and labor. He is the author of the forthcoming book Fight for Fifteen: The Right Wage for a Working America (New Press, 2016).